SOME things you’ve got to learn from experience. A year ago I would never have thought something as small as taking a break every day at work could actually make a difference to my mood and mental health. I would eat at my desk every day, never stopping to enjoy what I was having and never switching out of work mode. I was always trying to fit more into my work hours and if I, god forbid, did stop for a rest I was always filled with guilt that I wasn’t making the most of absolutely every minute of my day. It’s not until I went on leave recently that I realised just how important it is to actually take a break. I’ve got a fairly stressful job and I’d pretty much run myself into the ground by the time I went on holidays. You’re allocated that hour (or half hour) every working day, so why not take it? Feeling flat? Are the hours dragging by? That lunch break is yours to fill with whatever you like and at the end, you’re an hour closer to home time! Okay, sometimes you end up more sleepy than when you started but getting some fresh air can help with that, even if it’s just a stroll around the block or stretching your legs for a few minutes. Getting off the computer (or at least closing your work tabs) gives your brain a chance to have a break and, nine times out of ten, you’ll feel refreshed afterwards. This is especially useful when you’ve got to tackle an important task or something that needs a fresh set of eyes. I love taking a bit of time to catch up on my Twitter feed or see what other awesome creators are posting on Bloglovin! Bringing in a book to read or watching an episode of a TV series is also a great option. Have you been waiting all week to send an important email or buy event tickets? This is your chance. I work over an hour away from home so my evenings are pretty limited but having a break during the day gives me a chance to feel like I’m not working 24/7. Taking the time to tick one important thing off your list is incredibly satisfying. If your poor brain is constantly working overtime, it’s not going to be functioning at its best. Stress and anxiety build up over time and can cloud your thinking processes. At the very least, you feel like crap. Making a habit out of taking a while each day to focus on doing something that makes you happy is a great step to take towards improving your mental health. To be fair, there are some days where taking a chunk of time away from work in the middle of the day isn’t possible, but making the effort most days can be incredible. Take some time out – you deserve it! 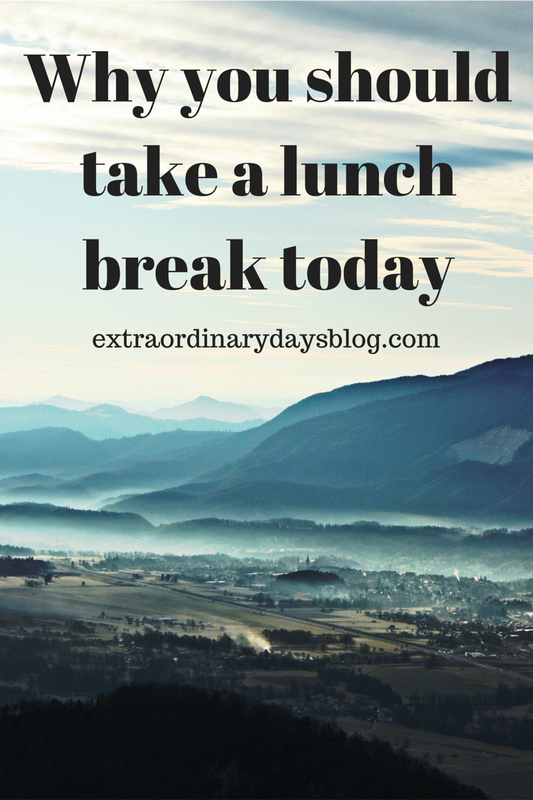 Do you take a lunch break? Or do you wish you did? This is such a simple, yet great idea! I am very guilty of not taking lunch breaks at work–always trying to fit more and more in–which just leaves me stressed. Thanks for the reminder that you can make your days more pleasant through small tasks! Good luck! It’s just not worth it if you end up feeling burnt out. I can relate to this so much, I have a fairly intense and at times stressful role, I also work over an hour away from home, and I stress even more if I am rushing to pick my son up from nursery and I am stuck in traffic. I recently had maternity leave and realised how important breaks are, however I admit I have quickly fallen back into the trap of never having breaks. Even more so as I have very restricted hours and have to work with childcare plans. I think making a list of things you need to do, such as online shopping for presents, or just reading a magazine or book, chatting to colleagues is a great way to take time out. I recently moved our staff eating area out of the main business area so people can actually go to a separate room for lunch and the internal feedback has been really positive. Ooh you’re totally right! It’s an extra hour of work that you don’t get paid for!